GLENDALE, ARIZONA --- Phoenix Coyotes General Manager Don Maloney announced tonight that the Coyotes have acquired defenseman Zbynek Michalek (z'BIGH-nehk, mih-KHAL-ihk) from the Pittsburgh Penguins in exchange for defenseman Harrison Ruopp, goaltender Marc Cheverie and the 81st selection in the 2012 NHL Entry Draft. The 6-foot-2, 210 pound Michalek registered 2-11-13 and 24 penalty minutes (PIM) in 62 games with Pittsburgh this season, while leading the team in blocked shots (144). He collected one assist and blocked nine shots in six postseason games. The Jindrichuv Hradec, Czech Republic native recorded 26-87-113 and 188 PIM in five seasons with the Coyotes (2005-06 – 2009-10). In eight NHL seasons with the Penguins, Coyotes and Minnesota Wild, the 29-year-old defenseman has registered 34-113-147 and 246 PIM. Michalek has also collected four assists in 20 career postseason games with the Penguins and Coyotes. Ruopp recorded 2-7-9 and 127 PIM in 62 games with Prince Albert (WHL) this season. 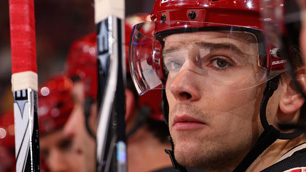 He was selected by the Coyotes in the third round (84th overall) in the 2011 NHL Entry Draft. Cheverie split the 2011-12 season between Gwinnett (ECHL) and Portland (AHL). He was acquired from the Florida Panthers in exchange for Justin Bernhardt, Sept. 8, 2011. The Coyotes acquired the 81st overall selection in the 2012 Entry Draft from the Philadelphia Flyers in exchange for the negotiating rights to Ilya Bryzgalov, June 7, 2011.